Hello, folks! Chief Komi here with our weekly update. It’s going to be a bit of a short update. Between working incredibly long hours at my day job (working this weekend; go go 12 days without a day off!) and getting the start of the development cycle rolling, I’ve forgotten what that sleep thing is. Still, there has been progress in the first week since the kickstarter’s completion and a few news updates. -Donations through Paypal are still going on for another couple of days. While this update is seemingly meaningless for the Kickstarter backers, it does mean that we are moving closer towards the next stretch goal. I’m not sure if we will make it there, but I will tally up the final number on the 1st and see if we made it over that mark. More news on this to follow in the next update. -Our first background is in! Natalie and her daring crew now have the ability to slip and fall off of the new cliff background and plummet to their untimely deaths on the mysterious jungle planet that hides untold treasures and secrets of the Chazari and the ancient order that protects them. -Preparation work on the new GUI to go with the investigation sections is underway. The current GUI is a mix of reused assets from Reborn and things that Komi put together. Right now, we are mostly just ensuring that the engine is both robust and easy to use. We are hoping to get the engine polished up and new assets finished in the upcoming weeks. A short demonstration to let the Kickstarter backers get a feel for some of the gameplay features is in the works. -Just like the artists, I’ve been hard at work in the script department. My fun this week has been writing the outlines for the four major story arcs. Each arc takes place on a different planet, each building upon the last as Natalie continues her quest for understanding and survival. Survival… that’s a good word to mention. The universe is a dangerous place, especially when every major faction wants you arrested, dead, as a sacrifice, or just wants to watch you suffer. The core parts of the story are being lain. I hope to be finished with that over the upcoming week so I can get into talking about some of the adventures that await you on each planet. One thing I can say is that a high-speed chase awaits you on Celestia as your former allies make their first move to bring the renegade investigator in for questioning. -No updates of music or voice acting yet. We have talked with a voice acting director who will be helping us get everything moving when the script is a little further along. For those of you who are interested in getting on as a VA, keep following these updates for when the auditions start. -Sorry for the short update. Next week we are going to go back to our special talks about each cast member and some of the stuff that went on behind the scenes for them. We talked about our villains previously (as well as our adorable Faye), so I’m thinking it is time to start talking about the permanent members of the investigation team. Will it be Kika, Zuri, or Sol? Tune in next time to find out! Hello, folks! It’s my proud duty to report that thanks to everyone’s help, Rising Angels: Fates will be a reality! Not only will it be a reality, but it’s going to be getting a special soundtrack, voice acting, and a special route with the Raltin ambassador. It’s been a wild and crazy road these past thirty days, full of ups and downs. Nevertheless, things came together! We ended with a grand total of $6,513.50 USD. Now the real adventure begins! Starting next Saturday, we will be posting weekly updates on development status and some of the fun tidbits and shenanigans that come with the development of a visual novel. I hope you all will follow along as we now bravely stride forward towards the game that awaits! Once again, thank you from the bottom of my heart. UPDATE: The KS exclusive route was removed and re-added back to the game. We listened to the mob and did something else instead. Please stop sending me hate mail over a year after this decision was reversed. This post is kept for historical purposes. Thank you. Hello, folks. Chief here to help explain why I approved the decision to make a kickstarter route exclusive. I’ve been getting a lot of angry stares across the bar about it, so I’m taking time from writing my updates about Faye and Natalie to discuss it. The decision to make a KS exclusive route was a difficult decision and one I didn’t make lightly. Since the studio’s inception, our stance has been firmly against any sort of corporate commercialism. I’ve funded everything out of pocket. My day job takes care of me, so I could fund everything without worrying about personal finances. I want as many people as possible to enjoy what I do. However, recent problems have forced me to cut project funding and keep my paycheck to assist with my personal life. It awaits to be seen if this will be a short term problem or long term. This has put me into a painful situation where I must ask those who have enjoyed my work to help keep things going. Not a dollar of this nor the sales of Fates is going into my pocket. It’s going straight into Fates so everyone has something to enjoy over nothing. It’s going to make sure the next game can have all the content you want and be accessible to the masses. However, if we don’t get past this barrier, none of that will ever happen. That’s why I’m giving this as a thank you to those who will prevent the crash of the studio. Without help now, there will be nothing for anyone to enjoy. I’ve been told a lot that I’m driving people towards piracy. If people want to pirate it, I can’t stop them. I work 50+ hrs a week before I even get home to do development, I quite literally don’t have the time. I very much understand why they’d do it. However, their actions aren’t going to be hurting me. As I said, nothing of this goes into my pockets or even compensates me for the writing as every dollar (including every dollar I can spare from my wallet) goes towards more art, music, and gameplay code. They’re hurting themselves and the others who enjoy the game because I’ll have to cut content, put us right back in this situation, or shut down development entirely. Old Chief Komi isn’t a businessman, he’s just a writer who wants to keep making things for people to enjoy. I hope this helps explain why I made this decision. Hello, folks! Komi here again with an exciting new update! I had a fun little build up planned for this, but I’m just too dang excited to beat around the bush. In a partnership with Sekai Project, IDHAS Studios is proud to announce that a special extended version of our hit visual novel, Rising Angels: Reborn, will be available on Steam on September 12th, 2014! That’s right, you heard it! 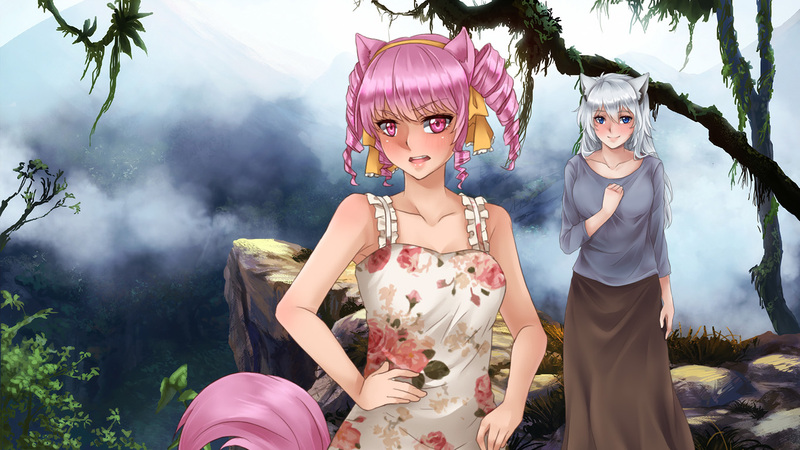 Not only are you getting the chance to download your favorite visual novel on one of the largest digital distribution systems, but it’ll be containing extra bonus content. There’ll be a few new CG and over 30% more story. New options, new routes, and the beginnings of a new yuri romance with another crew member! That means hours of new adventures, new additions to the soundtrack, and the cleaning up of a few buggers that slowed down the original release! Spread the word! Chief out! Since I haven’t had a video of the post since we were talking about the kickstarter (WHICH IS STILL GOING ON AND NEEDS YOUR HELP!!! ), let’s have one!